Atlas 21 #1, shown in the Total Valve Systems Flow Lab, performed as expected. The 130 Flow Coefficient and ISA 75.11 rangeability of 30 with the Extended-Range Linear trim was confirmed during the extensive series of tests. 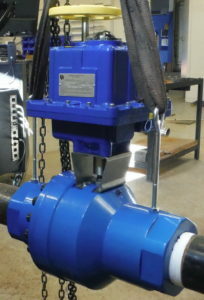 Nominally a 3″ valve, this Model 21 includes 4″ internal NPT connections. Atlas was equipped with an Indelac LA-12 high-resolution multi-turn actuator, capable of responding to a 5% signal change in 11 seconds. The control valve exhibited stable, compliant response well below 5% signal input (please consult VSI for the details about controlling “off the seat”). The thorough flow test program confirmed no other severe service control valve can offer a comparable combination of high capacity, accuracy, compact size and low cost.